Background/Info: Italian project Zoloft Evra has been active since 2014. They previously released 2 full lengths on CD and still released material on cassette format. They now strike back with their third full length album. 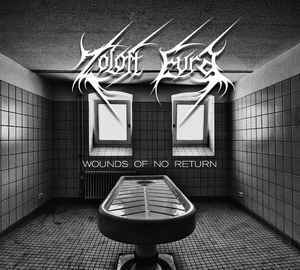 Content: “Wounds Of No Return” is mainly inspired by the darkest and most tormented formats of dark-ambient music. The tracks are featuring half-spoken like vocals, which resonate like ghosts in lost cellars. It only empowers feelings of terrors emerging from the work. You also will notice a kind of breathing sound noises and dark, vibrating sound waves. + + + : First of all I have to mention the great, artistic and cold-like artwork. It’s pretty illustrative for the dark and terror-like sounds from this work. Zoloft Evra accomplished a real fascinating and ultra-freaky work. The tracks have been masterly composed and I especially want to mention the great progression in the tracks. You’ll notice numerous sound effects and creepy, little noises while the ghost-like vocals are really essential. This is a work with a strong visual appeal. – – – : The album features 6 tracks. I like the progression running through the first 4 cuts, but both last pieces can’t convince me a similar way and even appears to be the anticlimax of this great work. Conclusion: I already heard a few previous works from this band, but “Wounds Of No Return” definitely sounds as their most successful opus. It’s a damned good tormenting sonic experience. Best songs: “Hooks Through Your Flesh”, “Last Injection Kiss”, “Wounds Of No Return”.